The Elder Scrolls series was mentioned by many respondents to the Queer Representation (2016) survey, highlighting its respresentation of sexuality, relationships, and gender, as well as its use of pronouns and its character creation system. Elder Scrolls Online was highlighted for its normalising of same-gender relationships, treating these as normal. Characters are never given the option to comment on this. Same-gender relationship options are given to characters throughout The Elder Scrolls series, with characters marrying the player-character without issue, although this does lend itself towards issues of playersexuality. Some respondents loved how simplified the relationship management system is in games like Skyrim, where you present a romanceable character with a medal and they will marry you. One respondent said that this simplicity allows the player to create their own narrative, with the player-character able to live the life they would like with their spouse. Others disliked this simplicity, as it means that you never grow attached to the characters you romance. 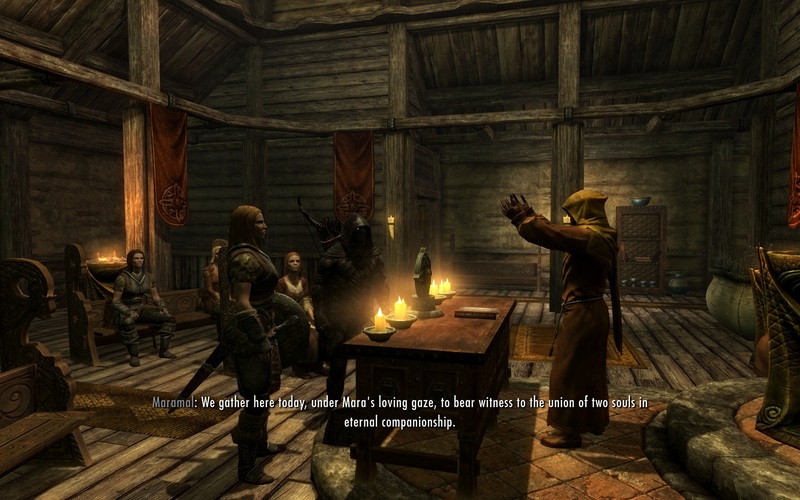 One respondent also noted that they particularly enjoyed the wedding scene in Skyrim, where all the characters that the player has helped through the narrative comes to be in the congregation. One respondent mentioned that it is difficult to find romanceable women in Skyrim, particularly who have a connection to narrative, questlines, or clans. They felt that most of the men felt 'significant' to the world, but the women are less integral. The player-character's gender is treated casually in The Elder Scrolls series, having little impact on the gameplay and the narrative. In Elder Scrolls Online, gender isn't used, with titles being prioritised. Gender pronouns are also rarely used in Skyrim, with dialogue favouring terms like 'the Dragonborn'. There seems to be a focus on a player-character's skills and abilities, rather than their gender. Gods in The Elder Scrolls series can be gender fluid. For example, Boethiah is depicted as masculine in Daggerfall, Morrowind, and Oblivion, but is feminine in Skyrim, and has both feminine and masculine presentations in Elder Scrolls Online. Mephala is described as both male and female throughout the series, and the term 'hermaphrodite' is used to refer to her gender diverse presentation. Vivec is canonically nonbinary, and there are references to this and his bisexuality throughout the series. There is an autobiography in the game describing his relationship with the goddess Almalexia, and a (potentially non-consensual) marriage to a villianous male god. In his own words, Vivec describes himself as a 'magical hermaphrodite' and is associated with Mephala. Respondents to the Queer Representation (2016) survey generally loved the character creators of The Elder Scrolls series. Freedom was often referred to as a positive in relation to these creators, though this freedom can lead to complexity that made the creators difficult to some respondents. There was praise for variety of body types and ethnicities that can be represented.